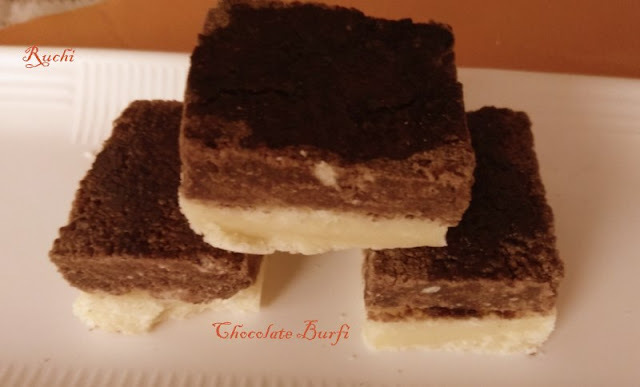 Chocolate Maida Burfi is a popular aromatic and delicious dish. It requires very few easily available ingredients made with maida flour, sugar, cocoa powder, milk and ghee. It is so easy to make.For this Diwali I tried this Double layer burfi.Wishing you all a Very Happy Diwali! 1.Keep a tray greased well, ready. 3.In another heavy bottomed pan, add sugar and 1/2 cup water. Boil until one string consistency. Its very important to get one string consistency. 4.Add Maida and vanilla essence to it and, switch off the flame. Mix well to a smooth pasteand keep stirring until the mixture thickens nicely and starts leaving the pan which indicates that it is ready. 1.Now follow the same process of heating ghee, add maida and mix well. Now add coco powder to it. Mix well and keep aside. 2.Prepare sugar syrup for one string consistency same as step 2 and add the coco mixture to it. Mix well off the fire and keep stirring. 3.When the mixture gets thick, pour it over the vanilla layer. Spread same as before to a smooth level using acup or laddle. 4.Let it set for atleast 1/2 hr and then cut into desired shape with a knife. Invert and tap gently over another tray to get the pieces separately. Next is to cut into desired shapes and enjoy.